Protecting your boat from dock damage or wreckage has been made easier with the Taylor Made line of Tuff End inflatable vinyl buoys. These tuff end buoys are available in sizes ranging from nine inches in diameter to 27 inches in diameter. All of the buoys have a heavy-duty seamless construction that makes them ideal for use within the commercial and even recreational marine industry. Boatersland Discount Marine Supplies has these Taylor Made inflatable buoys that are made from injection molded vinyl and have been tested to 2,000-PSI tensile strength. This is the strongest inflatable vinyl buoy in the industry. 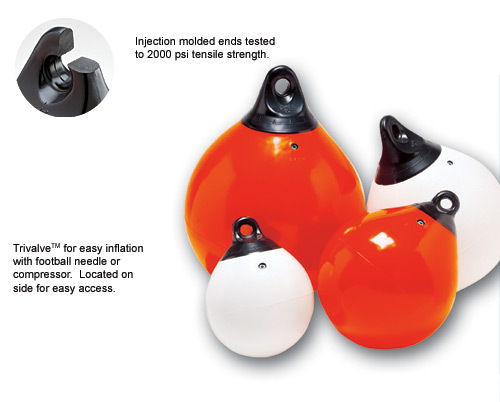 These buoys are available as solid orange or solid white devices, and both use a tri-valve that allows you to inflate the buoys with a football needle or compressor. Taylor Made uses a unique fluorescent color process that applies a “back-up” color to the buoys that resists fading. As a result, these buoys retain their color far longer than other models on the market. In addition to using these buoys on your boat as fenders, these Tuff End inflatable buoys also work well when used for mooring your watercraft and for marking off areas in the water that you do not want boat traffic to enter, such as areas designated for swimming. The orange buoy in particular would be great for use as a market because of their high visibility. However you choose to use these Tuff End buoys, know that these Taylor Made products are of very high quality and at Boatersland, they are very reasonably priced. Taylor Made Tuff End Inflatable Vinyl Buoy 9'' x 28"